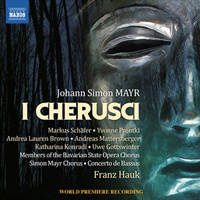 SIMON MAYR (1763-1845): I Cherusci (World Premiere Recording). Description: Composed when Napoleon’s armies were striding across Europe, Mayr’s highly charged opera is set in ancient Germania in the time of Christ’s birth, its narrative focusing on the perils of the captured slave girl Tusnelda who has been chosen for a sacrificial ritual. The universal themes of freedom and patriotism in this pioneering tale of familial bonds, romance, jealousy and desperate misadventure would later attract the likes of Beethoven and Verdi. 2 CDs. No libretto. Yvonne Prentki, Andrea Lauren Brown (sopranos), Markus Schäfer (tenor), Andreas Mattersberger (bass), Members of the Bavarian State Opera Chorus, Simon Mayr Chorus, Concerto de Bassus; Franz Hauk.